Flavor Qualities Less acidic than hot coffee, slightly sweet, very smooth, well balanced, & strong/bold coffee flavor. Stand Up Pouch Packaging 3-Layer Natural Kraft + Foil re-sealable bag. Includes a one-way de-gassing valve to maintain freshness & aroma. Using French Press 1. Add ground coffee & cold, filtered water to French Press (we recommend a 4:1 ratio of water & coffee. For example, 4 cups of cold filtered water to 1 cup of ground coffee). 2. Stir, cover & leave in fridge overnight 3. After ~ 12 hours, press & enjoy! Using a Mason Jar 1. Add ground coffee & cold, filtered water to jar (we recommend a 4:1 ratio of water & coffee). 2. Stir, cover with lid, & leave in fridge overnight 3. After ~ 12 hours, strain coffee using a fine mesh strainer and/or cheesecloth & enjoy! 1 LB RESEALABLE BAG: Our 3-Layer natural kraft + foil resealable bag ensures top quality freshness for your coffee! COLD BREW RESERVE: Artfully crafted to make delicious cold/iced coffee. Cold brew requires special attention to the bean's origin & quality, grind size, & roast level. TASTE PROFILE: Low acidity, slightly sweet, smooth, well balanced, & bold coffee flavor. 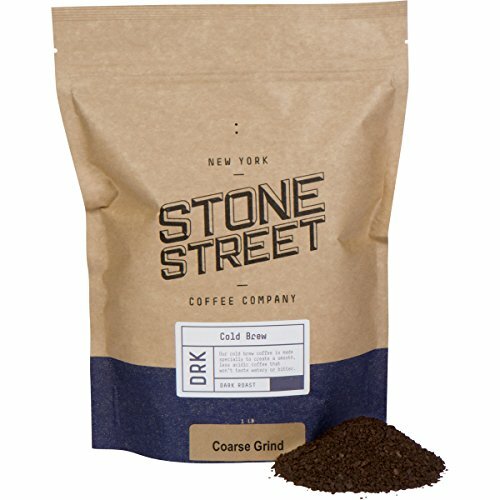 If you have any questions about this product by Stone Street Coffee, contact us by completing and submitting the form below. If you are looking for a specif part number, please include it with your message.